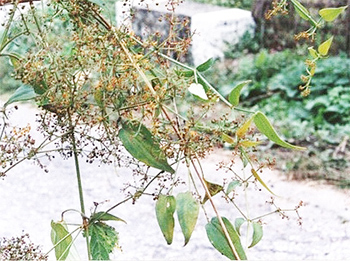 Manjistha, scientifically known as Rubia cordifolia, also known as Red Madder Root, grows in hilly districts. The dried root of the plant has excellent medicinal properties, and is cooling, astringent and has affinity for blood. Manjistha is a valuable herb in Ayurveda. Ancient physician and sage, Charaka, categorized the herb as ‘varnya’ or the one that improves complexion, reduces fever, and as a detoxifier. In other words, it is also a popular ‘rasayana’, or a ‘rejuvenative’. Another great sage of Ayurveda and ancient Indian surgeon, Sushruta, referred Manjistha for pacifying pitta dosha. In Ayurveda, it is believed that the three life energies or doshas (vata, pitta and kapha), should remain in perfectly balanced condition always, for a person to enjoy good health. Hence, Manjistha helps in maintaining the balance of pitta dosha effectively. Kerala, in India, has been practising Ayurveda for thousands of years now, and the physicians here have always recommended Manjistha as part of their treatments from times immemorial, due to its blood purifying and anti-oxidant properties. The bright colour of Manjistha is evident in oils like ‘Mahanarayan oil’ and ‘Pinda thailam’, with the bright red colour depicting healthy blood. Manjistha is thought to have affinity with capillary system, and its slow action helps to detoxify and repair the fine structures that interface with lymph system. Ayurveda believes that Manjistha is a popular herb for lymphatic support, as it facilitates cell nutrition and removal of toxins from the body. Manjistha is often used with equal quantities of Haridra for balanced thermal effect during skin disturbances like boils, rashes, eruptions, and stagnations. When wounds are washed with decoction of Manjistha, and are dressed with its solid extract, it quickens healing. Chronic, non-healing and oozing wounds particularly heal effectively with Manjistha. It also helps in treating varicose veins, eczema, bruising, psoriasis and bleeding disorders. During fractures too, an external splint of Manjistha is beneficial. Apart from these, it keeps the skin glowing, removes pimples, freckles and discoloration. When externally used as a paste either alone or with honey, Manjistha helps heal inflammation and renders a smooth and an even tone to the skin. As a beauty aid, 100gms of dried and crushed orange peels, and 50gms each of sandal powder, turmeric and manjistha are combined to make a face pack. The plant is widely used as a rejuvenative herb, in treating pigment disorders of the skin, and is used in general debility. Manjistha is used as medicine to treat hepatitis, diabetes and urinary calculi. Manjistha works well during diarrhea and when combined with lodhra skin powder. The herb is beneficial in gastrointestinal ailments like dyspepsia, loss of appetite, worm infestations, an appetizer, aids digestion, and kills toxins and is also a vermicide. Manjistha acts a blood purifier, and acts mainly on rasa and rakta srotasas, it controls irritation of nerves, pacifies mind, is salutary in epilepsy cases, particularly of pitta type. The decoction of manjistha is also beneficial in treating gout, when combined with other herbs. Manjistha has a vital role in supporting heart health. Studies have shown that it regulates blood pressure, blood vessel constriction and reduces tendency of blood to form clots. Manjistha also has a visible effect on female reproductive organs, and hence is used to treat gynaecological problems like irregular menstruation, white discharge. The col infusion of Manjistha improves menstrual bleeding disorders and relieves pain in dysmenorrhea. It also stimulates and cleanses uterus, is useful in postnatal ailments, oligomenorrhea and amenorrhea. Manjistha is also an excellent anti-diabetic and is useful in treatment of urinary calculi. Hence, on the whole, this wonder-herb heals, cures, and beautifies, and therefore is considered as the ‘herb of choice’ in Ayurveda.